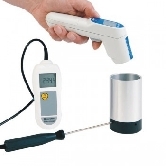 The infrared thermometer Comparator provides a stable black body temperature source and is an inexpensive way of checking infrared hand held thermometers when used in conjunction with a Reference thermometer. The Comparator consists of an aluminium cup Ø60 x 100 mm with a solid matt black base. The base incorporates two Ø3.5 mm holes, one for a Reference thermometer's probe and the other for an additional probe, if required. The Comparator can be used at any ambient temperature over the range of 5 to 100°C. The information from the Reference thermometer can be used to compensate for minor differences in the readings from the test instrument. Delivered with the Precision Plus thermometer. These calibrators offer a high level of stability (±0.5°C) and a stabilisation time of five minutes. Plug it in, switch it on, set the verification temperature with the front panel buttons and insert your probe into the correct size well. Compare the temperature reading of your thermometer to the display and the difference is the error. The 3001 dry-well will accept probe sizes Ø3.3, 4, 4.76 and 6.35 mm. The 3002 dry-well will accept probe sizes Ø3.3, 4.76, 6.35 and 9.6 mm. The 3003 dry-well will accept probe sizes Ø4.76 and 12.7 mm. The unit incorporates two removable wells/inserts, both Ø13mm in diameter and will accept probe sizes Ø3.3, 4.1, 4.8, 6.4 and 9.6 mm. Each 3101 is supplied with two inserts of the customer's choice. This calibrator offers the temperature range of - 35 to 200°C. It has large well which is filled with liquid (Water+Methanol /Silicon Oil). The liquid is heated or cooled to the desired temperature. Methanol+Water is used for Negative Temperature and Silicon Oil for Heating. It is is a temperature source to check and calibrate TCs, Resistance Thermometers, Temperature transmitters, glass thermometers, thermostats, etc.